Home Eye Problems Eye Problems Cont. Conditions such as dog eye allergies, inflammation and dog eye infections are the most common types of dog health eye problems. Other conditions such as congenital (inherited) developmental problems, injuries and cancerous developments mostly cause a disturbance in the anatomical makeup of a dog eye and disturb the eye physiology, due to which secondary problems may occur. In some cases, canine eye problems can be related to systemic health, meaning that diseases negatively impacting the body can also harm the eyes. You might note a dog eye problem and changes in overall vision health with systemic diseases such as Diabetes Mellitus, Hypocalcemia (low blood calcium), Cushing's Disease and Systemic high Blood Pressure etc. These systemic conditions can cause cataracts, corneal disease, hemorrhages and vascular tension. Dog eye health can be affected by minor to major inflammatory reactions. Inflammation is an immediate response by the body towards any abnormality. 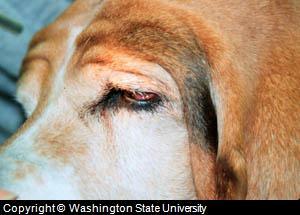 Canine eye inflammation can be noticed in almost every canine eye problem. Inflammatory response in a dog eye can be characterized by classic symptoms such as swelling, redness, pain/irritation, elevated temperature and loss of function. Most canine eye problems are exhibited by inflammatory signs in general, which is why it is why an inflammatory response is non – specific, one can identify multiple dog eye health problems that are associated with this symptom. For this reason, to confirm a specific canine eye disorder, other differential symptoms and laboratory tests are required. Canine eye inflammation removal is always treated symptomatically, with help of anti-inflammatory drugs and corticosteroids. These drugs are administered in the form of ointments and dog eye drops, which should only be administered with a prescription. Some natural remedies may help to reduce the severity of inflammatory canine eye problems. There are several factors in the environment, in dog food and a dog's own immune system, which may trigger an inflammatory and acute immune system response. Since, the surface of dog eyes are exposed to the environment and are sensitive as well, many allergenic factors such as pollens, dust etc. can easily cause localized dog eye allergy problems. In a systemic way, dog food can also affect dog eye health, by causing allergies which mostly affect the skin and digestive tract, but eyes can also be affected. Canine eye problems casued by allergies are characterized by irritation, redness, excessive tear flow and discomfort. 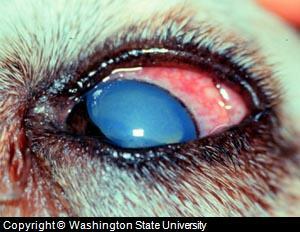 Canine eye allergies are mostly acute in nature (appear suddenly) and cause extreme discomfort to the patient. In cases where a dog is rubbing the eyes, and/or lives in unhygienic conditions, secondary complications such as dog eye injuries and bacterial infections may occur. Allergies are managed with help of specific anti histaminic drugs and by preventing factors that cause the allergies. Allergies may recur, which is usually due to a dog with a hypersensitive immune system and the existence of allergic factors. Anti allergy drugs can help to reduce the severity of the immune response, but they cannot specifically treat allergies, therefore preventive measures are more important in in the management of dog eye allergies. Use of a dog Eye wash and the regular use of commercial natural remedies can help to reduce the chance of an allergic canine eye problems..
Canine eye infections are common canine eye problems. 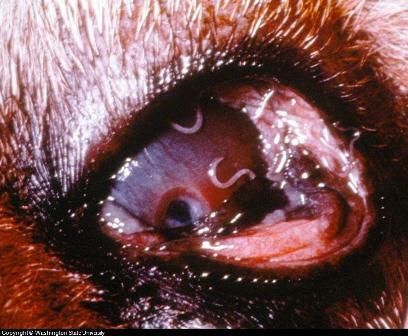 Infection may effect different parts of dog eyes, such as eyelids, inner eyelids, the surface of the eye, cornea, sclera, eye orbital, glands etc. In terms of etiology or cause, these infections may be bacterial, viral and fungal. Eye infections or abnormalities caused by microbes may be primary (start in the eye) or secondary in nature (triggered by another problem), causing inflammatory symptoms and excessive dog eye discharge mixed with pus and dead tissues. Different common dog eye infections, whether they are primary or secondary may be conjunctivitis, blepharitis, Dacryocystitis, Keratoconjunctivitis, Secondary Keratitis and Chorioretinitis. Canine eye infections are specifically treated with the help of antibiotics and supportive therapies. Antibiotics may be locally delivered in the form of eye drops, ointments and washing solutions. In some cases, (chronic and generalized eye infections), antibiotics are also prescribed in the form of tablets/syrups delivered through an oral route. Symptomatic treatment is done with the help of anti-inflammatory drugs and upon elimination of any microbes, corticosteroids. Natural remedies, if used on regular basis along with specific and symptomatic treatment can enhance recovery and overall dog eye health. Minor dog eye infections can easily be treated with these remedies. 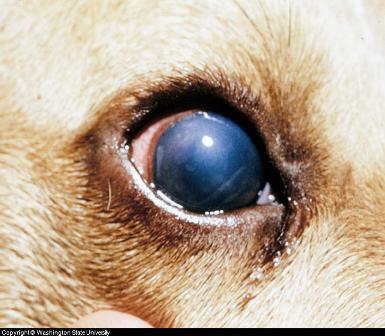 Canine ey problems cause by parasites such as dog eye worms can severely affect dog eye health. These specifically infest a dog eye causing blockage and severe symptoms such as conjunctivitis, excessive watering, opacity, ulcers, and sores along with discomfort to the affected dog. Other kinds of parasites that move over the face and head region include mites and fleas etc. can cause dog eye symptoms. These parasites that cause canine eye problems are specifically treated with potentially anti-parasitic therapeutics in the form of ointments, eye drops and generalized administration of anti-parasitic preparations. Natural remedies can help provide added support during recovery and improve eye health during later stages of healing, while regular dog eye cleaning can ensure the prevention of future problems. Dog eye anatomy can be disturbed due to congenital or inherited developmental canine eye problems, injuries, chronic infections and exposure to some serious irritants such as chemicals etc. As the result of each canine eye problem, not only is the eye anatomy disturbed, but also, the overall physiology of the dog eye is badly affected. Anatomical abnormalities primarily require a surgical approach to treatment along with medical support and prescription therapeutics. Natural remedies and symptomatic therapeutics can be used to enhance recovery after surgery. Dogs with congenital problems require more attention and care throughout their life. Regular checkups, extreme care and regular use of supportive eye health supplements and remedies is highly recommended. Accidental dog eye trauma or dog eye injury can lead to severe dog health eye problems, which if not treated can leave a dog with eye ulcerations. These injuries mostly occur on the surface of the eye, causing corneal ulceration or canine ulcerative Keratitis. These dog eye ulcers and accidental dog eye injuries heal relatively slowly and require medical and surgical assistance. Initially, treatment follows the recommended medical and surgical approach for treatment. To enhance recovery during advanced healing stages, supportive measures such as symptomatic therapeutics and natural remedies are recommended. Depending upon the dog eye health problems, dog eye function may be severely affected. Major functions the the eye, i.e. special sensory function (vision) can be affected due to any of the aforementioned problems. Most of them are acute and result in the partial loss of function, but in other cases, chronic defects in parts of the eye, cancers, loss of anatomical features in accidents and aging are other reasons for functional defects in dog eyes. These conditions usually require life long medical support and surgical treatment. The ratio of recovery depends upon the status the of canine eye problem, age and overall dog eye health condition. Supportive measures can help to improve the dog eye condition, but complete recovery in these conditions is never confirmed. These may be benign (not spreading or dangerous) in nature, but most of them are malignant in nature (fast growing, cancerous, spreading) and are noted to be adenocarcinomas. 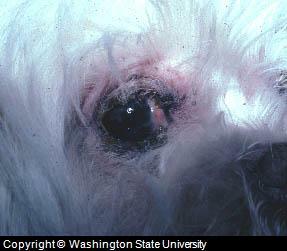 Dog eye tumors may progress with time and age, thus causing progressive loss of dog eye function. 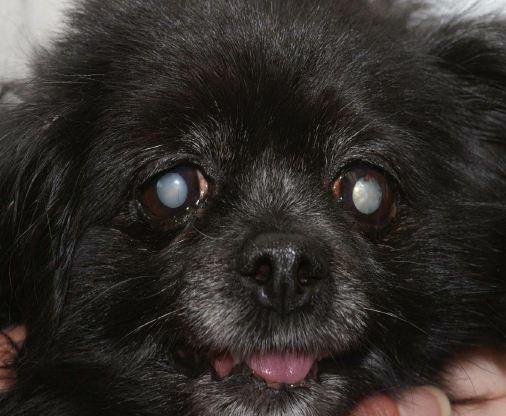 During the initial stages of the canine eye disease, i.e. low degree cancerous tissues can be excised surgically, but in advanced stages, these are hard to treat and complete excision (dog eye removal) may be indicated. Eye Heal: Eye Heal is a natural remedy product can be used over the surface of the eye to improve dog eye health, and to support specific therapies recommended by your veterinarian. This is an important point. Natural remedies are not termed specific, meaning they aren't a prescription medication like antibiotics, which kill bacteria. What they do is strengthen the overall physiology or health of the eye, so that your dog's natural defenses against dog eye disease work better. Because of this, we recommend the use of natural remedies like Eye Heal in addition to dog eye medicines recommended by your veterinarian. Natural remedies can also be used to treat mild dog eye infections, since with a little help, a dog can fight these types of problems naturally. i-Clenz: i-Clenz is a natural remedy formulated to clean the areas around the eyes, such as dog tear stains. It is a natural way to clean the face and eyelids and to prevent bacterial growth. Be sure to follow the manufacturers instructions. This product is often used in combination with ea dog eye wash solution. The advantage of natural remedies is that they are gentle and safe to use if from a reputable manufacturer with little risk of an adverse reaction. Like any product you give your pet, observe them after using anything new just in case, but since these are herbal products there is very little risk. For owners that would like to use something a bit stronger, the products listed below could be helpful, particularly if natural remedies are not having the desired effect or in addition to the use of natural remedies. In terms of a recommended commercial dog eye wash solutions, we suggest using dog eye wash pads such as R-7 to help remove bacteria around the eyes. An solution such as PNP Dog Eye Wash, which contains ingredients such as boric acid, sodium borate and sodium chloride, when can be effectively used on the surface of the dog eye for removing allergens, debris and any dust particles.